My interest in computers goes way back -- back to the 1980's and the famous Commodore 64/128 line of home computers. 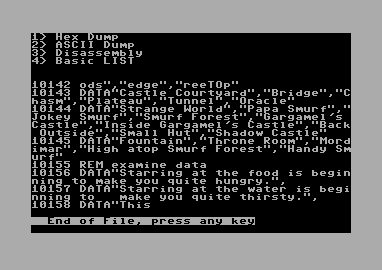 I first became interested in computing in 1983, when my uncle brought home a Commodore 64. Way ahead of it's time, the 64 had a 320 x 200 resolution display, with 16 colors, 8 individual sprites and a built-in speech synthesizer providing up to 3 voices. Printing was done with the Panasonic KX-1080i printer. 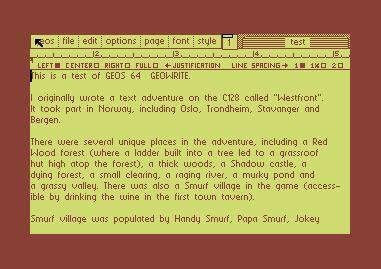 We had a lot of fun on the Commodore, spending countless hours playing video games, programming, writing -- and printing -- documents (via a word processor), and even typing in program listings from Commodore-specific computer magazines (e.g. Compute! 's Gazette, Run, Ahoy!, etc.). (left) Playing Lusty MUD (circa 1994). After the 486 finally gave up the ghost, I upgraded in 1997 to a Hewlett Packard Pavilion 7360 PC, which had 32 MB of RAM, a 200mhz Pentium processor with MMX technology, a 3.8 GB hard disk drive, a 33.6 kbs Plug-N-Play modem and a 16X CD-ROM drive. The computer served me well throughout college until I upgraded to an e-Machines i400 with 32MB, a 400mhz processor and Windows 98 (in 1999). 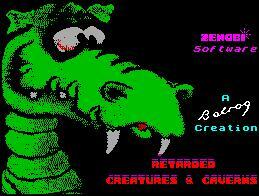 (left) Playing Retarded Creatures and Caverns on the ZX Spectrum. (left) Playing 'Enchanter: Westfront to Apse' (circa 1995). 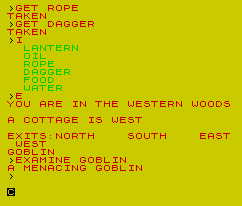 (left) Playing Dunric's 8k Adventure on the ZX Spectrum. (left) Listing a program with Lixter. The Rabbits of Avalon Hill - my featured short story about rabbits who have lost their carrots. Commodore Memories - An article on some of my memories related to the Commodore. Early Computing Memories - A nice article on my early computer memories, stemming from 1983 to the mid-1990s. More Computing Memories - Another article on my early computer memories, stemming from 1983 to the mid-1990s. The Seven Dreams of Paul - read about a series of seven unusual dreams that I had once -- all in one night! 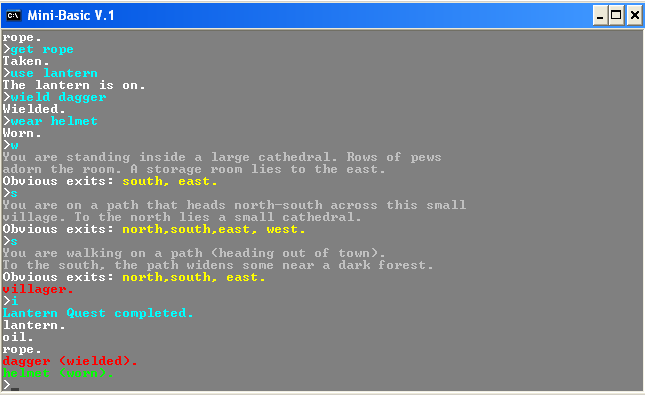 The Story of Westfront to Apse - a retrospective piece on my first ever game. Brings back a lot of memories. Song #54 - a hip-hop song that I wrote just for fun. Not sure how it would sound if actually played. The Snail Dream - another dream that I had, this time involving a snail and a magic carpet ride. Sprite-Topia - my storyboard for a video game where the 'sprites' need help finding their way home. The Diskette Experiments - the original (and now infamous) diskette experiments, as conducted by this person from 2003 to 2006. The Numerica Format - read about my numerical sequencing method for encoding data. A Loom that also plays music? - my recent theory on a magical loom in space that can be used to play music. The Linux Rainbow - why Linux will ultimately succeed (originally published in Linux World magazine). An interview with Gustav - all about the Finland programmer who discovered a message from God. An interview with Gustav, Part II - a second look at Gustav. 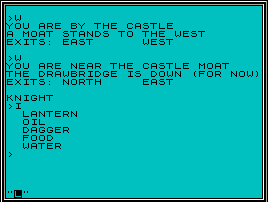 The Frontiers of Adventure - a retrospective on the history of adventure games. Waterlog - my quest for the perfect balance between drinking too little water and too much. The Golden Cat - the mystical adventures of Howie, the Golden Cat. I have included here several games that I have written, spanning a time period from 1995 to the present. I am still active in programming, and have programmed in languages ranging from the Commodore 64's BASIC 2.0 to Randall Hyde's excellent High Level Assembly (HLA). (left) Playing HLA Adventure in Windows XP (circa July 2005). (right) Playing Twilight of the Valkyries in MS-DOS (circa April 1999). (left) Marty Francom's ScreenBuilder v1.0. I have written a number of articles for Linux and Windows specific magazines and online publications, including Byte, Dr. Dobb's Journal and Linux World. Here are but a sampling of these works below. I have always been a huge fan of sports, in particular American college and professional football and basketball. My favorite sport, though, is college football. I love the Arizona State Sun Devils and have been a HUGE fan of their team since the 1980s. Although I graduated from Northern Arizona University in Flagstaff, I am at heart a Sun Devil. When I'm not watching sports, I enjoy reading, writing and programming. I also like religion, science fiction, history, art and music. The list goes on and on. Most of my interests have been evolving over time, including a love of computers and art. I also like technology and how data is stored on CDs and disks. (left) Playing Dunric's 8k Adventure on the ZX-81. Here are several links that I have found in my internet travels. The first link is part of this homepage, as it is my Commodore-specific website called The Commodore User II. The rest are pages from around the web that I found interesting or otherwise useful. The Commodore User II - my own website devoted to the classic 8-bit Commodore 64/128 line of personal computers. Tolkien Adventure Games - a website reviewing several adventure gaamees in the J.R.R. Tolkien Lord of the Rings mold. Brass Lantern - a website of interactive fiction enthusiasts, games, reviews and much, much more. Eidolon's Inn - MULE - a retrospective website on the greatneess tthat is the multi-player classic game M.U.L.E. Welcome to ExtremeMULEing! - another retrospective website of the classic game. The Magnetic Scrolls Memorial - a fantastic website devoted to the memory of Magnetic Scrolls, makers of The Pawn. Artemis' --LustyMUD-- Odds and Ends Site - a website from a legendary LustyMUD player and fan, Artemis. SaveSURGE.org - Dedicated to the preservation of SURGE - speaks for itself. A website devoted to saving SURGE soda. (left) Playing Crossroads 2: Pandemonium on the Commodore 64. That's it for now. I hope to add more useful links in the near future! Note: The images used on this page were found via Google Image search. If anyone objects to my use of these images, please e-mail me and I'll promptly remove them. Thanks! Website content, with the exception of images, (C)opyright 2004-2006 by Paul Panks.